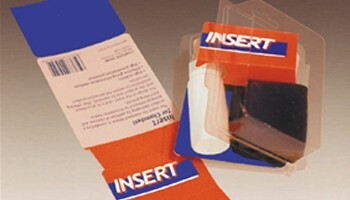 INSERT - Dominion Printing inc. These printed and die-cut cards fit in a 2 part blister, called clamshell. Single cards or cards folded in 2 or 3, these inserts can be a very important source of information for marketing products. 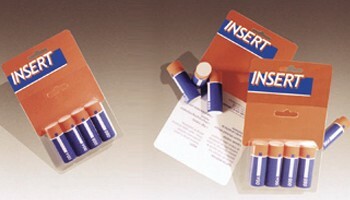 Double blister, reclosable; the product can be seen on 2 sides, hung on hooks in a display. It’s not necessary to seal, just small cavities are enough to keep it closed.